Please send your comments on your stay with us at Poplar Ridge Lodge for us to post on this page. All comments and suggestions are welcome, especially your views on the facilities and of course... the fishing! Any tips would be helpful too. from the time they picked us up at the launch until they took us back. stay is a pleasant one. Thank you for an incredible hunt. I know that I cannot wait to come back. Hi guys thank you both so much as well as Mike and Colby (S.S.) for a great experience the memories will last a life time. Not only did I come out of the bush with a bear but some new good friends. You guys are the best!!!! Looking at the web sight makes me sad I miss it all already. I will be back for sure in 08 if not sooner if I can swing it. Again thanks for everything. My comment on the website: This is a great website. Every picture & statment is true I have been there. 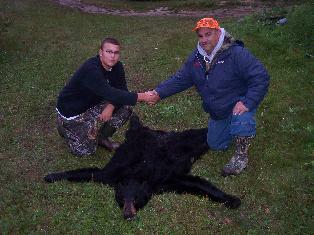 My stay at Poplar Ridge Lodge: My bear hunt at Poplar Ridge was by far the best vacation I've ever had!!! Darrel delivered a stand with a huge bear as promised, and provided me with the best, most exciting tracking experience of my life!!! Darrel, Karen, and Coby were awesome people that made our trip!!!!! The Fishing: I never thought I'd see the day when pike became a nuisance, but I was really sick of catching them!! 15 to 25 inch pike were as common as ants at a picnic!! The jumbo perch were less common, but accessible and extremely tasty!!! 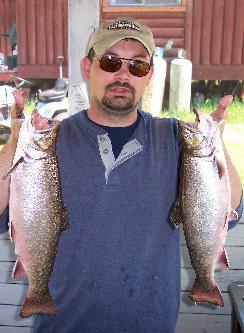 The walleye were there as well, and tasted great!!! Canadian fishing at its finest!!! I just wanted to thank you again for your hospitality. Your facility is top notch and un-matched. You and Darrel were a pleasure to be around and you work hard at keeping the lodge in order and clean. best Pike fisheries in the world! Thank You again and i hope you all have a successful hunting season! in a lot of gear compared to a fly in. out of his way to help some people he didn't know. and I foresee Christi and I returning on a regular basis. We both had a very relaxing and pleasant vacation. hate to leave. I wish us Americans would treat the land better and keep it clean. Once again thank you for the great experience. We all had a great time, thanks for the hospitality. You guys did a great job of taking care of our needs. provide top notch customer service. 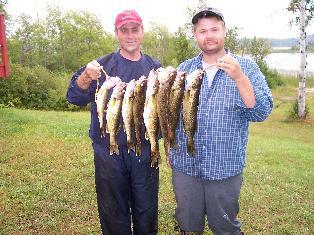 Excellent walleye, perch, pike and trout fishing. had more fun there than all his trips to the camp in **** they used to go to, and he will be back. Thanks for the pictures on the web site. We were lucky to have a professional chef with us in the first week of the season. Other than the best pull pork I've ever tasted, he made us the delicious yet simple Cedar Plank Trout. Soak an UNTREATED cedar plank in water for at least half an hour. Preheat grill. Fillet that trout, but leave the skin on. Brush fillets with oil then rub on salt and pepper. Top with thin slices of lemon and dill to taste. place fish skin down on plank. Close the lid and grill for about 15 minutes or until the fish is done. next few days. You both created a cherished memory for my son my father and me.